closest cross street is TUSTIN AVE. Parking: The Center has Parking for customers in the front and a Public Parking Lot in back for overflow. Front center Parking is FREE - Back lot Parking charges $1 an hour (cash, coin, card or App) from 8am-6pm everyday. Free after 6pm!! 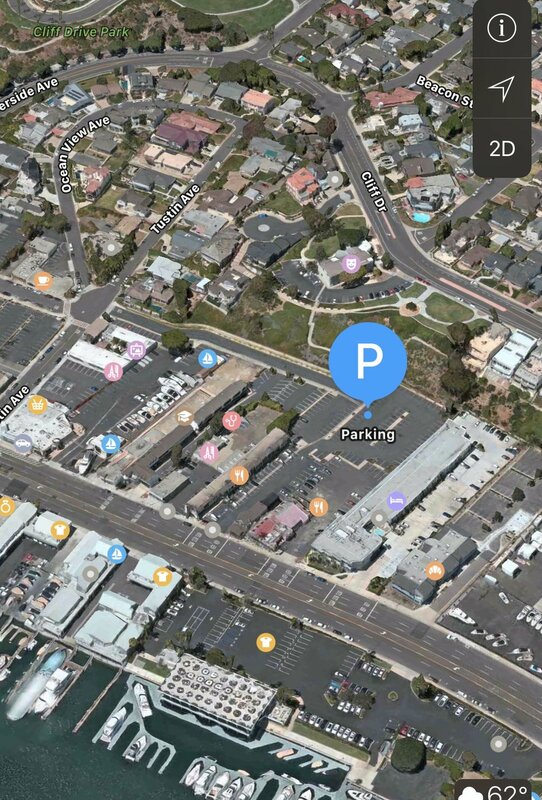 You can access the Parking lot from Tustin ave. & Riverside ave. -via- Avon street … No more fighting the PCH turn lane! Location in Center: Suite S. We will be located above the newly Opened SOL GRILLE. Look for the NEON PEACH in the Window and the Peach stairway! Our upstairs unit has lots of light, windows, a beautiful year-round breeze and a view of the Bay! Neighbors: Enjoy SOL GRILLE ’s delicious food and wine after class with your girls! The center has all the hair, nails, lashes and brows needs covered, including the Newport Brow queen; Brows by Julie ! We are also walking distance to Starbucks and C’est Si Bon - because life it about balance! Classes: More room!! - with the same intimate feel, individualized attention and the friendly Peach Community vibe you know and love! Access: We are directly off PCH but we suggest using Riverside ave, or Tustin Ave to enter from the back - safer and less stress than fighting PCH traffic. Plenty of parking! Back Paid parking lot is FREE before 8am and after 6pm - $1 an hour in between. We are SO EXCITED for this new Space!